Signing up as an Advisor is as simple as ordering a product. Learn more about the CM Advisor opportunity. If you are planning to sign as an Advisor, sign up before ordering and make sure you receive the email titled Welcome to confirm your Advisor status. 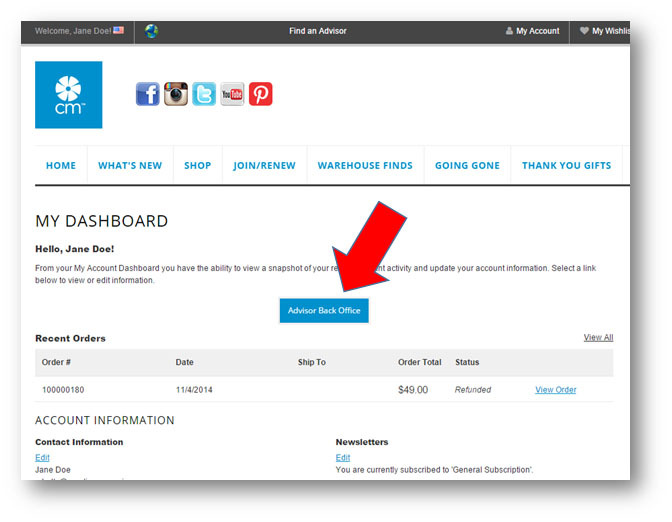 It’s important to sign up BEFORE you place your first order to ensure your order is included in your account balance. If you order as a customer, then sign as an Advisor, your customer order will not count toward your balance. These examples show someone signing up direct to the Company. 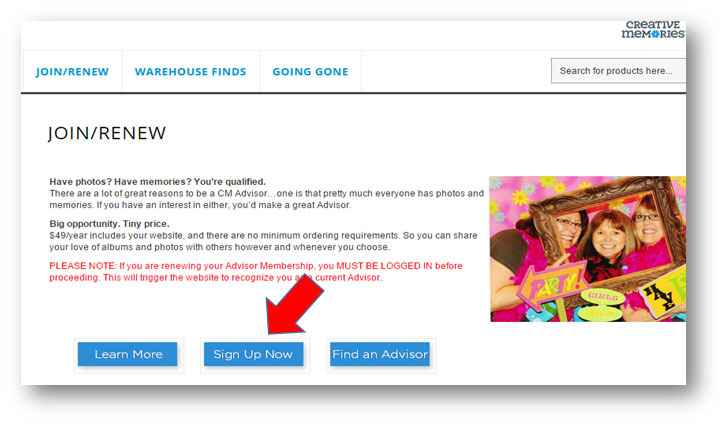 If you wish to sign under a current Advisor, you’ll want to come to the site through their Advisor link. You can also choose your intended upline Advisor as you’re going through checkout. 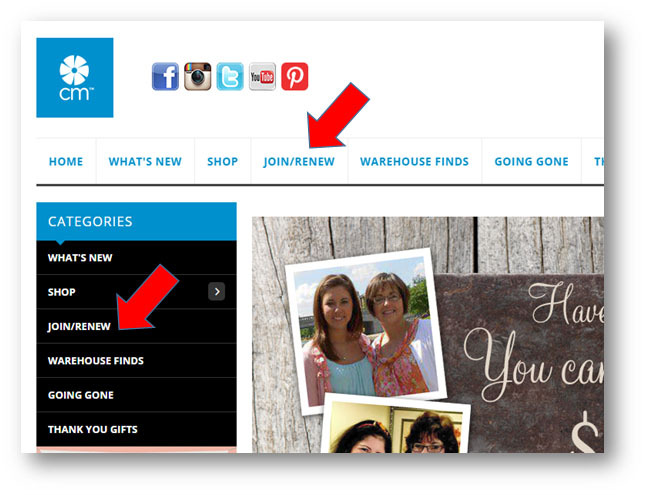 To sign up, select “Join” on the top or left navigation. From the Join page you can click Learn More to get more detail on the Advisor program. Choose Sign Up Now to purchase the Advisor fee. After reviewing the Advisor Agreement and Policies, click the check box accepting the terms, then click Add to Cart and go through the Checkout process. Next you’ll want to click on My Account on the top of the site. This is your Dashboard where your personal order history will appear. To get to the Advisor back office, click the blue button. Below is the Advisor back office home page. It shares the three things you’ll want to do first. The most important is visiting the Advisor Basics page. It offers step-by-step tips on getting started, including how to set up your link, upload your photo, appear on the Advisor locator and more. Follow the steps, and that’s it – you’re in business! Welcome! 1. “Your Advisor:” – links and cookies. When I come through another Advisor’s link to sign up, I see their name and “Your Advisor” under the shopping cart. Once I signed up as an Advisor, their name disappears. Does that mean I am no longer connected to them? That means the site is working as it should. 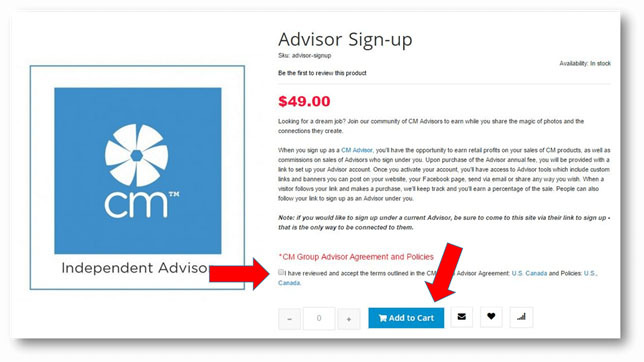 Once you sign up as an Advisor, you will see your own name on the site. 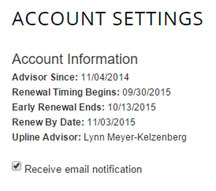 Your upline’s name is shown under your Settings in the Advisor back office, as shown to the right. When you come through another Advisor’s link, the site thinks you are a customer. So it will show “Your Advisor:” and their photo next to the shopping cart. If you are a customer and sign up to be an Advisor, the “Your Advisor” (now your upline) will disappear from under that area and it will be you instead. 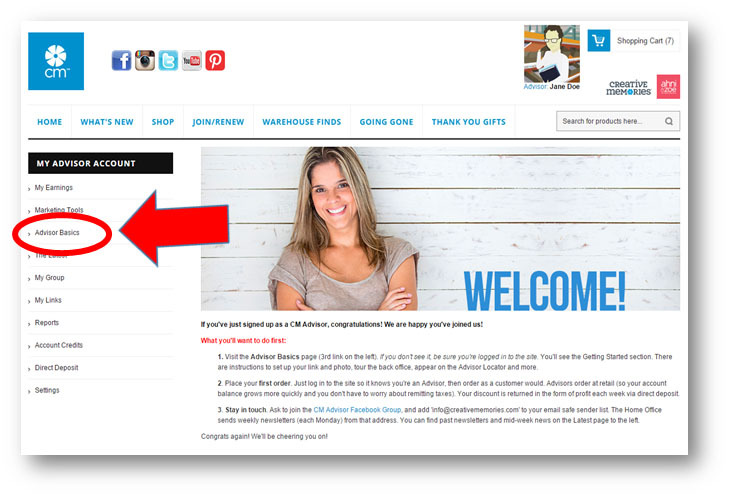 The way to know if the site recognizes you (and that you’re logged in) is whether or not it says “Welcome, Your Name!” in the top left of the black header. If you see that, you’re logged in and the site knows it’s you. So you can order, check your back office, etc. as an Advisor. 2. I just signed up as an Advisor, and as I’m ordering, the site is not showing an Advisor discount. Advisors order at retail so that your account balance grows faster, and so you have the same experience your customers do. You receive your ‘discount’ back as profit, as well as commissions earned on team members weekly for all Advisors who are signed up for direct deposit. The new CM Advisor opportunity was designed with both the casual scrapbooker and the income- and team-builder in mind. It’s based on the simple principle that the more you do, the more you earn. With this plan, noting what it isn’t is as important as what it includes. There are no minimums and no personal volume, group volume or leader requirements. Really. There are no titles or ranks…everyone who signs up is a CM Advisor. You can sign up directly or under an existing Advisor…the choice is yours. Thank you for sharing your excitement! We’ve been hearing from people across North America (and all over the world), that nothing compares to Creative Memories’ products for quality, design and longevity. And now they’re available alongside the fresh, easy-to-complete Ahni & Zoe line.